He says the other former minister was the first to make the declaration about interacting with one of the Guptas. Former finance minister Trevor Manuel told the commission of inquiry into state capture on Thursday that “a tense discussion about the influence of the Guptas” triggered former minister of sports and recreation Fikile Mbalula’s “emotional outburst” at an ANC NEC meeting about his interaction with one of the controversial Gupta brothers. Manuel conceded that he may not accurately recall the events of the ANC NEC meeting of August 2011 due to a lapse in time. 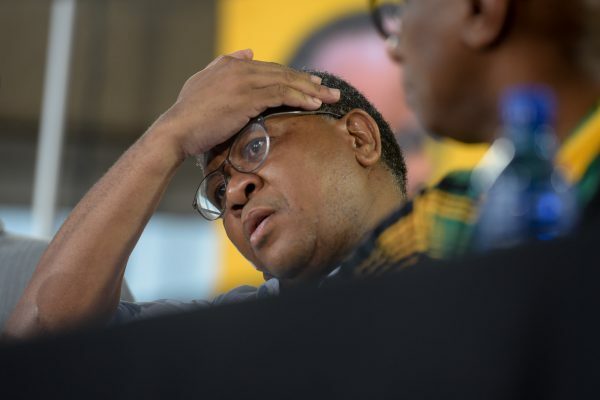 Mbalula’s “emotional outburst” was in response to what started as a political overview by former ANC and state president Jacob Zuma and an issue emerging from the floor about the Guptas’ influence on Zuma, Manuel said. The former finance minister said an emotional Mbalula told the NEC that he had been advised by one of the Gupta brothers that he would be promoted from deputy minister of police to minister of sports and recreation, a promotion which occurred in 2010. “My recollection of it is that when it came to the opportunity for Mr Mbalula to speak in that meeting, he became very emotional,” Manuel said. Manuel added that in the exchange of the open letters between himself and Mbalula over the matter, he referred to Mbalula as “weeping” during the meeting, adding that he did not intend to embarrass Mbalula with the use of this word. “It was an exceedingly difficult, emotional situation [for him],” Manuel said. Manuel said what Mbalula said in the NEC meeting was that he was called to Saxonwold to be told by one of the Gupta brothers about the promotion, adding that he was aware there was confusion in whether it had been Ajay or Atul Gupta with whom Mbalula had interacted. Evidence leader at the commission advocate Leah Gcabashe said Ajay Gupta had since claimed it was he who had had the discussion with Mbalula and not Atul as Manuel stated in his statement before the inquiry. Gcabashe said Ajay Gupta has submitted to the commission that he simply wanted to congratulate Mbalula on him becoming “a full minister”. Manuel said what was concerning about the interaction is that the president’s constitutionally protected prerogative to appoint ministers was violated when the Guptas were informed about Mbalula’s promotion. Manuel added that at the time, certain individuals were invited to Saxonwold, “but he [Mbalula] was the first to make that declaration about how he was appointed”. “It confirmed that these things were actually happening,” Manuel said. The former finance minister said the admission by Ajay Gupta that he had in fact interacted with Mbalula and not his brother Atul, “confirms there was a sense of abdication” by Zuma to carry out his constitutionally protected prerogative to appoint ministers. Gcabashe said Ajay Gupta has disputed some of the evidence in Manuel’s statement at the commission, with the Gupta brother saying that he had simply read media articles which tipped that Mbalula would be due for a promotion and so wanted to congratulate him and that when he did this, he, Ajay Gupta, did not mention the portfolio in which Mbalula would serve as minister. Manuel said the fact that Mbalula had been called to the Gupta compound in Saxonwold signalled to “a sense of authority” from the controversial family and a sense of “expectation”. Gcabashe questioned Manuel whether during the ANC NEC meeting reported speculations that the plan had been to promote Mbalula to full minister of police were raised, to which Manuel said it was not.